Experience. Dr. Leung introduced Down-up LASIK and has been pioneering this advanced technique in San Diego. Experience. Dr. Leung is listed in the Guide to Top Doctors. Being selected by other physicians as one of the "Top-Rated Physicians in America" is quite an honor. Experience. Dr. Leung is the first ophthalmologist in the world to perform live refractive surgery on the world wide web. Experience. In 1985, Dr. Leung participated in excimer laser research that led to its current clinical applications. Experience. Dr. Leung performed the first refractive eye surgery at the prestigious Doheny Eye Institute in Los Angeles where many excimer laser research studies have originated. Experience. In 1985, Dr. Leung pioneered research on the surgical correction of astigmatism that was presented at national meetings of eye surgeons. Dr. Leung was instrumental in the development of formulas for the surgical correction of astigmatism. Experience. Dr. Leung assisted Dr. Fyodorov of Moscow with teaching refractive surgery techniques to other ophthalmologists. Experience. The clinical work being done at the San Diego Eye & Laser Center by Dr. Leung caught the imagination of the public and media and was featured on many local and national radio and television programs, newspapers and publications. He has been a leading authority on the excimer laser. Experience. Dr. Leung was the first ophthalmologist in San Diego to perform photorefractive keratectomy using the Visx laser outside of the FDA study. Experience. Dr. Leung continues to teach other ophthalmologists and residents refractive surgical techniques, and was named a clinical instructor at the University of California at San Diego Medical Center. 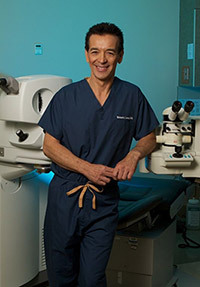 Dr. Richard Leung is an internationally recognized ophthalmologist specializing in refractive and laser eye surgery. He has pioneered Laser in-Situ Keratomileusis (LASIK) and has performed thousands of laser vision correction procedures. Dr. Leung gained fame and captured the attention of people worldwide when he performed the world's first live Internet LASIK Procedure. He has the distinction of being chosen as one of the "Top-Rated Physicians in America". Why Choose San Diego Eye Center For LASIK? LASIK is a great choice for those tired of the hassles of contact lenses and eye glasses. Choosing the right practice can be challenging. So why choose San Diego Eye Center for your LASIK procedure? There are many reasons, but all revolve around one major factor: EXPERIENCE. Learn more about our Experience in regards to Laser Vision correction. Are you ready to be free of glasses and contact lenses? There are many vision corrections options available to you! We encourage you to read more about these exciting procedures and to schedule a consultation to determine what vision correction option best suits you. Whether it be LASIK, PRK, premium intraocular lenses, or other forms of vision correction offered at San Diego Eye Center, our goal is to free you from your dependency on glasses or contact lenses. Do you have cataracts? Did you know that you can now significantly reduce or even eliminate your dependency on eye glasses after cataract surgery? You now can due to the advanced technology of premium intraocular lenses! Learn more about your premium lens options. Learn what our patients have to say about Dr. Richard Leung at San Diego Eye & Laser Center. Click here to read testimonials. If you are seeking clear vision, do not let your finances get in the way! We are pleased to offer CareCredit financing to our patients. CareCredit is your healthcare Credit Card! With affordable payment options and 0% financing, you can afford the clear vision you have been dreaming of.